This book is a welcome addition to the growing number of Korean textbooks in the market. According to the author, this book is for students who have completed at least 1 year of an intensive Korean course or equivalent. It does not explain grammar points in details and hence should be used only as a supplementary resource. The author has kindly made available the first 16 pages in pdf format and it includes the first story. Check it out HERE. Visit the author’s site for her other books. Hi! I want to start studying Korean soon. I also love kdramas 🙂 I look forward to the rest of the textbook reviews! Hope you will have a fun time learning korean too! There are some online resources at the ‘Korean resources’ page if you need any! I wish i have a teacher too. 이 책은 어떻게 샀어요? 좀 비싼 것 같은테요..
Hello, I’m also from Singapore and have been self-studying the Korean language for about 1/2 year. Came across this book some time ago but was somehow hesitant to purchase it. Did you get this online? Also, please let me know if it’s worth S$50. bleahs. i didn’t purchase this XD hahaha i don’t think it’s worth the money though >< not that kind of book where you will keep refering to. haha i didn’t buy this. (: borrowed this from my school lib. Haha.. I was about to ask you where you got it and then I saw sadstory’s question… Wonder if we can get it from Kino…. I picked this book up from 교보문고 last month and although I have yet to delve into it, it certainly seems to be the perfect balance of culture, new content, self-checking, grammar introduction and self-studying. As soon as I get into, I’ll review it, too. And for the price, here in Korea for less than 30 USD. Did you know that there’s a workbook, too? Thank you, Shanna. I was looking for new material to learn from. 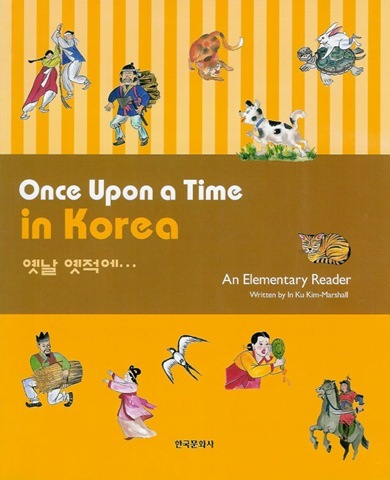 “Once Upon a Time in Korea”…This book looks so interesting. I will ask about it at my local Korean store. I am learning Korean please help me How can i buy this book?